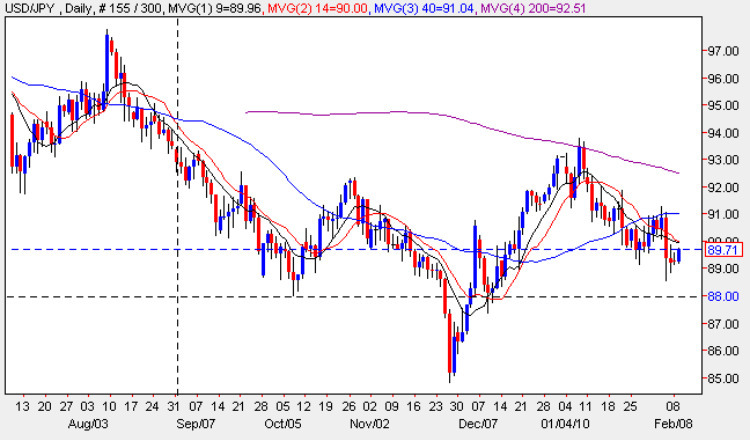 The yen to dollar yen pair continue to prove an extremely difficult currency pair to trade, as this key forex pair remain range bound between 94 to the upside and 85 to the downside as the struggle between the two safe haven currencies continues unabated. The mid January breakout that was initially signalled on the 7th January last month, failed to materialise, and was subsequently seen as a fake out, with the 200 day moving average providing the barrier to any move higher on the daily chart. Subsequently we have seen the currency pair slide lower once again, with a return of US dollar strength being counterbalanced by falling equities and a preference for risk averse investors to look towards the Japanese yen rather than the US dollar. In recent weeks the short term moving averages have played an increasingly important role with the high of each day finding strong resistance both from the 9 day and 14 day moving averages, with the 40 day moving average adding further to the short term bearish picture, with Thursday’s wide spread down candle breaching all three averages once again. As with many of the major forex pairs yesterday’s thin news saw a day of sideways price action, with little movement from a narrow trading range, with the candle simply confirming the previous day’s doji cross indicating indecision in the market. The key to the longer term ofcourse is the likley response of the BOJ to any further strengthening in the Japanese yen, with 85 now clearly defined as the pain threshold for the currency pair. In the short term we may expect to see a small bounce higher given the doji signal of Friday, and with little meaningful news this week, coupled with a national holiday on Thursday, further sideways price action seems likely, so my suggestion for trading this pair is to look for short term intra day trades to the long side.